Not all liberals are pro-choice. (Example: me.) Not all liberals are anti-death penalty. I can't even be general and say "most" are that way. You're overgeneralizing. Not all liberals agree with either of these viewpoints. 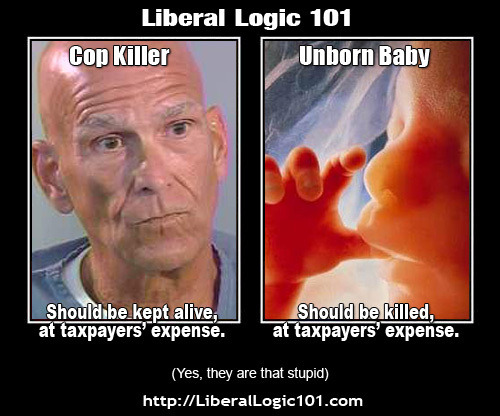 I'm not a fan of the death penalty, but that's for a number of reasons, one of which is - wait for it - taxpayer expense! People who receive the death penalty tend to appeal that ruling many, many times. All of those appeals cost money, and they tend to make the state pay for them. In fact, this ends up costing more than life imprisonment for these same people. I'm pro-choice, but the way it's phrased here is absurd. Pro-choice does not mean advocating abortion for all mothers. We don't advocate its use, we advocate the option, for a number of reasons. If you want to have this conversation, I'm happy to have it, but it seems you've already got a very slanted viewpoint. I'm what I guess would be considered a "liberal" in America, and I'm pro-death penalty in the right circumstances. I'm also pro-choice, but you'll find very, very few people, liberal or otherwise, are pro-abortion. These posters are hilarious because they do nothing more than highlight the ignorance of the groups of people who genuinely believe that they are making some sort of statement against liberal thought. It's hilariously pathetic.